If humans are benevolent by nature, how do societies become corrupt? And how do governments founded upon the defense of individual rights degenerate into tyranny? These are the questions addressed by Jean-Jacques Rousseau's Discourse on the Origin of Inequality, a strikingly original inquiry into much-explored issues of 18th-century (and subsequent) philosophy: human nature and the best form of government. Rousseau takes an innovative approach by introducing a "hypothetical history" that presents a theoretical view of people in a pre-social condition and the ensuing effects of civilization. In his sweeping account of humanity's social and political development, the author develops a theory of human evolution that prefigures Darwinian thought and encompasses aspects of ethics, sociology, and epistemology. He concludes that people are inevitably corrupt as a result of both natural (or physical) inequalities and moral (or political) inequalities. 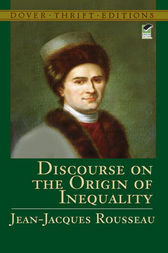 One of the most influential works of the Enlightenment, the Discourse on the Origin of Inequality offers a thought-provoking account of society's origins and a keen criticism of unequal modern political institutions.